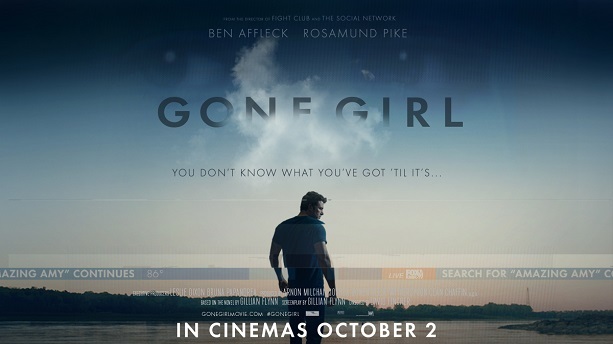 Gone Girl is thrilling, it is breathtaking and it is exceptionally crafted but, it is not what you expect it to be. Firstly, considering the body of work David Fincher carries with him, the expectations from the film are and have been, unspeakably high. “THE NEW THRILLER BY DAVID FINCHER” is, in itself, one of the heaviest statements in the movie business as of today. Gone Girl is inherently, a sharp, hard hitting thriller, that pierces through the minds and motives of characters, deep enough to project the grotesquely harsh reality, from many, many view points. Nick Dunne, played by Ben Affleck, comes back home one day to find his wife, Amy Dunne, played by Rosamund Pike, missing. The entire process of investigation, in some way, reveals lesser about the mystery and more about the motives, insecurities and the overall aching reality surrounding Nick and Amy’s marriage. We switch from one view point to another and from one side of the story to another. Every character in the film, named or unnamed, in some way, projects a reality. The entire idea that, while watching a film, one sides with a character knowingly or unknowingly, barks out loudly at your face, while watching Gone Girl. You know the character and you know about the wrongdoings. In someway, you have to choose the less worse but that too, is incredibly difficult. The shockingly deep portrayal of the causes that break marriages and efforts required to keep it alive are put up ever so handsomely. The screenplay moves forward in a way that controls the pace of the film with a great amount of intelligence. The gripping nature of the film does not come out of forcefully induced plot points that twist you this way and that. We get insights into the minds of characters, we hear out their reasons and then we keep moving ahead. Their motives themselves are revealed just at the right time. It is unbelievable how Fincher depicts the stages in relationships as well as how the filmmaker chooses to hide certain probable character interests, leaving them for your thoughts to ponder around. The inside and the outside of a person come out strongly and subtly in the film through force and pressure. But most importantly, the film shockingly reveals ideas surrounding relationship troubles, disagreements, infidelity, trust, insecurity and above all, the truth. Neil Patrick Harris and Emily Ratajkowski’s characters have their fair share of space in the plot, but they both signify a lot more in the larger picture. The larger picture that you have to draw, yourself. As we move further and further we get deeper and deeper into the psyche of the characters we are watching, we have been watching, but we don’t yet know. The film is a problem. It is, largely but softly, the depiction of a problem, in the larger picture. We do not know the answer to the problem. It is for us to know and it is for us to work out, in our heads. There is a lot that goes on in the minds of people in a relationship that comes across fearlessly and strongly through this picture in a way that shakes you up on the inside. If you try to ponder about every man and woman in the film, their motives, what they represent, their tolerance, their strong and weak points and ideas about their identities, you will be surprised with the excitingly shocking inferences you’d arrive at. The film’s exceptional soundtrack by Trent Reznor and Atticus Finch invokes a feeling that is a complex mixture of mystery and misery. The soundtrack helps one ease into the World Fincher tries to create, so so well. Something that is never a surprise when it comes to a David Fincher film is the terrific set of performances. Many are aware of Fincher’s method of shooting i.e shooting a hell lot of footage and his idea of keeping the actors in their zone by making them spend their time acting as much as possible (Interestingly, David Fincher claims to have shot 500 hours of footage for this film!) Ben Affleck, never really known for the power of his performances perviously, clearly puts out his best with this film. Rosamund Pike’s performance is simply commendable. It is powerful and thought provoking. Her expressions and her overall screen presence, both are extremely important to the film. Gone Girl, genuinely, has too much to tell you. It communicates with your mind. Probably, you would not want to talk about your character sidings and inferences from the film, to anybody and you will not, probably. It highly depends on how much you can let a film inside. Coming back to the statement “It is not what you expect it to be”, in simple terms, it is not a regular thriller. It is not a film that promises to keep you on the edge of your seat because of forcefully induced plot points that twist you around, as said before. It moves you, it disturbs you and it makes you think. It is a thriller that is of a different kind. It is unfair if you expect only a certain kind of a thriller from David Fincher. If you expect another The Girl with the Dragon Tattoo, go re watch that film. Keep doing that. But before going into this film it is important not to expect your own, personally crafted definition of a Fincher thriller. David Fincher has made memorable thrillers but each time, they have been different and a new challenge all together. That is something that cannot be forgotten. The film moves you, shakes you and may be, it could even scare you, somewhere deep down. The film tries to make less statements and allows you to be confused. The kind of confusion you would want to be a part of because it communicates with you, a lot. Gone Girl is exceptionally well crafted and incredibly directed. It is definitely one of the best films to come out of Hollywood so far this year, if not the best. After all, David Fincher never ceases to amaze you. I give the film 4/5.